Just for Valentines Day, I thought I’d share this article I wrote for the paper this week! Enjoy! In 1939 William Rhymer was 23, and he considered himself a “charmer” in his Soldier Hill neighbourhood. But despite all his luck with the ladies, only one of them captured his heart: 19-year-old Josephine Nibbs. So he sent her parents a letter asking for permission to date their daughter. Mr. Rhymer received permission, and after a year of dating the couple married. They have been together ever since. On Tuesday, as birds chirped and wind blew through their hilltop home, Mr. Rhymer, 97, leaned over and kissed his 94-year-old wife. 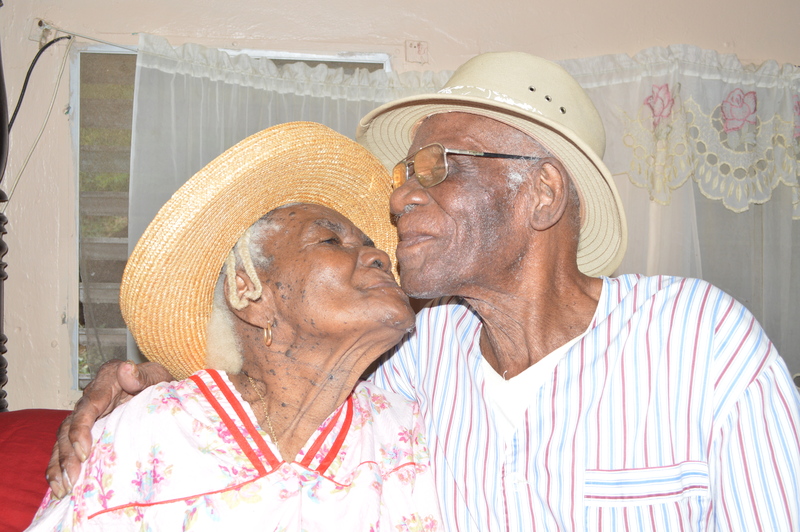 After 74 years and 10 children, the couple said, the romance still has not gone out of their marriage. As they reminisced, they sat on a bed covered in red sheets — the colour they use each year to celebrate Valentine’s Day. Apart from being beautiful, Ms. Rhymer was different from other girls her age, her husband recalled. In his eyes, his wife hasn’t changed much since then. “For 74 years, you know, you see she is still shy of me,” he said as she giggled, looking away. “He is still my prince charming,” she said. Their 1940 wedding in Soldier Hill was a community celebration. The celebration continued for about a week, her husband added. After their marriage, Mr. Rhymer did his best to take care of his wife, he said. The secret to a long marriage is openness, the couple agreed. They also shared all they had with one another. While Mr. Rhymer farmed and fished, his wife maintained order in the home. The fulltime homemaker attributed the couple’s longevity to their diet and lifestyle. “We ate more fish than meat, even though there was a lot of meat then,” she said. Seventy-four years of marriage wasn’t without its challenges, however. Asked if they would change anything about their past, they both answered in the negative. Several times during the interview, the couple quoted Bible scriptures.